Dunlop Rover H/T tires are the company’s latest generation of truck/SUV/crossover tire that combine solid all-season traction and handling, with a more comfortable ride. Whether it be on rain or light snowy roads, the Rover HT is built to get you to where you need to be. 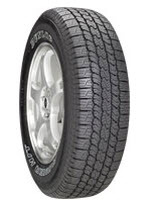 The tire itself features a symmetric tread pattern and an interlocking center rib that provides better handling. When the weather turns for the worse, the added zig-zag shoulder block sipes, V-Lock grooves and intermediate blocks are what get you through the rain or snow covered roads. Ride comfort is increased and enhanced through Dunlop’s computer optimized tread pitch that dramatically reduces outside road noise. Inside the tread you’ll find twin steel belts and a polyester ply that help give the Rover H/T better tire wear and a smoother ride. VersaLoad technology is used which maximizes the footprint and provides more strength and stability in the corners or at higher speeds on the highway. Overall, the Dunlop Rover HT gives you solid all-weather traction to go along with more than adequate performance on dry road surfaces. With its smooth ride and 60,000 mile tread warranty, this tire comes in at a good value and is a popular choice amongt other similar models. Prices on the Rover HT range from around $120 for the 15 inch series to approximately $207 for the much larger 20 inch series tire. Who Are Dunlop Rover H/T Tires Designed For? Dunlop has designed the Rover H/T for drivers of all types of SUV’s, crossovers and pickup trucks, who want a tire that offers year round handling and performance regardless of weather or season, as well as a smooth and more comfortable ride. Dunlop Tires backs the Rover HT with a 6 year or 60,000 mile warranty on P metric sizes, and 6 years or 45,000 miles on LT series tires. Tire uniformity is guaranteed for 6 months or the first 2/32 inch of wear. Materials and workmanship are covered for 6 years and call for first year or first 2/32 inch of wear free replacement. Dunlop follows that up with a prorated amount for the remaining time period or until there is less than 2/32 inch of useable tread depth left on the tire.